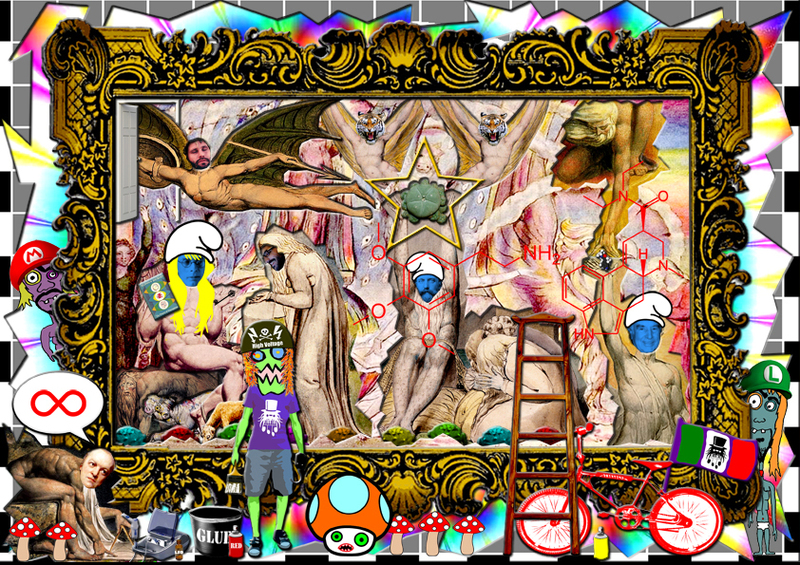 Biutifool Beastard is a Bmx pirate and a visual mash up artist restyling and remixing the works of the Great Masters of history of art. He makes his works slicing 'mastery' paintings using his left hooked hand and then re-arranging his favourite bits all together. Doing so, he aims to create new works with new bizarre (off the wall) but in topic storylines with a freaky fancy look and a more catching visual 'language'... remix to create new stories based on and inspired by old stories, to extrapolate the subjects of the paintings from their original past contexts and to throw them into new comical, grottesque, eccentric contemporary scenarios. Characters from old times meet characters from modern times and everything is possible and everything can happen like Dominque Ingres falling in love with Barbie or Serge Gainsbourg playing songs in Manet's favourite brothel. Biutifool Beastard pays tribute to the great masters but also he mocks them, he is a prankster and an unusual erudite chap. His mission is to make the so called 'high' art/culture more accessible for everybody, to tickle the curiosity of the indifferent, often excluded and distant public. He believes that all depends about how art is shown to people to pick their attentions and to drive them towards unexplored fields and previously undesired or obscured facts. Art is made by people. Knowledge is made by people. 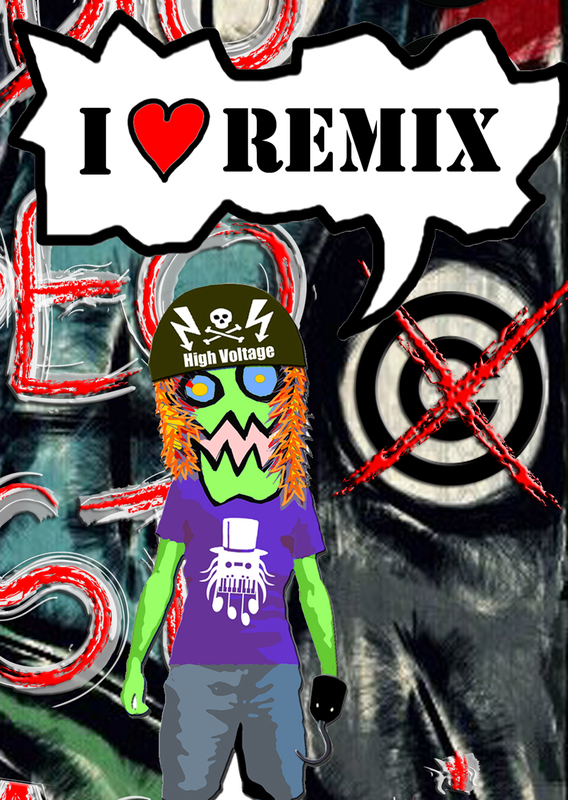 Culture is made by people, REMIXING FOR THE PEOPLE! Unfortunately life is not easy for our dear friend. 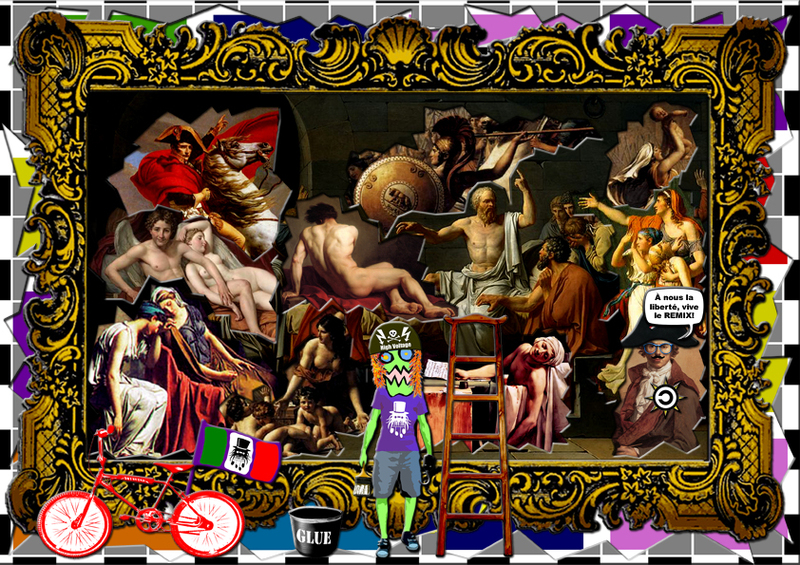 Biutifool Beastard respects the works of his fellow colleagues and he wishes to preserve the original paintings, he is not a vandal neither a thief. He would love to ask the permission directly to the artists but sadly they are all dead. So he uses duplications of works. Unfortunately some 'copies' are protected by exclusive rights owned either by private corporations or by public/private institutions and he hasnbt got neither a cent to pay for obtaining the legal use of them, neither he has the will of doing so. Art is made by people for the people. The present is built on the past and the past canbt be priced forever. To price images, aswell as to price sounds, videos and texts, is to price knowledge and to price knowledge is not just about making it elitist but itbs also an attempt to control knowledge, to control culture. Biutifool Beastard believes that freeing arts from 'the all rights reserved' helps the spreading of informations and notions and culture globally and also enriches the collective imaginary expanding its boundaries resulting in a consequent improvement of peoplebs life style making them more serene and happy. 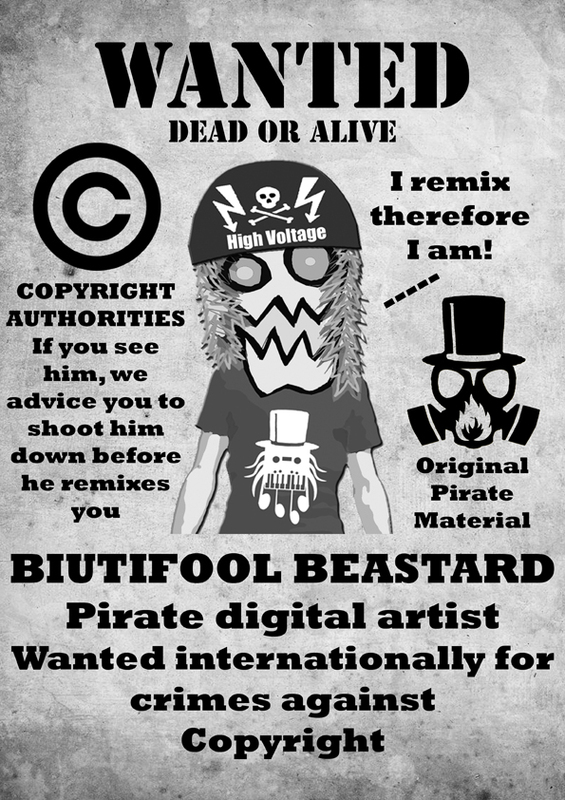 Biutifool Beastard is a support campaing for the use of digital medias and the use of remix techniques into the making of art. It is also a support campaing for the Creative Commons and Copyleft licences in terms of protection of intellectual rights in matters of the creations of images, sounds, videos, texts. It is a support campaing for free culture and the freedom of sharing contents and informations without the control by corporations and private or public institution. DOMENICO BARRA, neapolitan artist, approched and started his practice in the field of visual art during his 7 years of life in England, Great Britain, studying at the Leeds College of Art and Design. His creative production interests a wide use of techniques such as installation, digital art, mixed medias paintings with a choice of subjects spreading from works with sociopolitical concerns to works with a more introspective approch. The works of D. Barra are characterized by an eccentric use of colours. The artist lights up his creative flair with any tools or objects on his hand, works of a very strong visual impact and out of the boundries of "style" of mass consumption art. D. Barra has exhibited either in Italy or abroad his native country with a preference towards unusual spaces outside the common and enlightened "temples" consecrated to the worship of art excellences. The perpetuating creative dialectic of D. Barra results in a constant research for innovative artistic results in matters of subjects and the ways they can be depicted. He collaborates with the Italian Music Label "Subcava Sonora". He is the graphic designer for the advertisement campaigns for the NGO "Sensacional". D. Barra also is the co-founder of the fashion accessories firm "RAZE Excessories" and he is member of the Neapolitan Artist Collective "URTO!" His works were featured on various magazine and websites such as Revolutionart Magazine, Players, The Villager Newspaper, Time Out New York and Reset Radio website, Corriere del Mezzogiorno, Libero Pensiero.